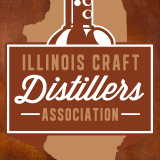 Distillery Members – We welcome any distillery that produces a distilled product in Illinois, so long as the distillery holds a federal DSP (Distilled Spirits Plant) license and holds a State of Illinois Class 9 Craft Distiller Permit. Distillery Members receive monthly news & updates, invitations to participate in a variety of events throughout the year, and opportunities to participate in our marketing, lobbying and legislative efforts on behalf the industry, as well as other benefits. Provisional Distillery Members – We also welcome distilleries that are in the process of obtaining the licenses required to be a full Distillery Member, and they receive many of the same benefits (but do not have the right to vote in organization business until fully licensed). Associate Members – We invite liquor industry tradespeople or suppliers who do business with the distilling industry, and others in allied industries or endeavors to join us as non-voting members of our organization. Associate Members receive exclusive invitations to organization events, periodic advertisements in our monthly newsletter, and many other benefits. Enthusiast Members (Under development) – We invite spirits enthusiasts to join us as non-voting members as well. Enthusiast Members will receive exclusive invitations and passes for organization events, organization news & updates, and many other benefits. If you’d like to inquire about joining us, please get in touch!